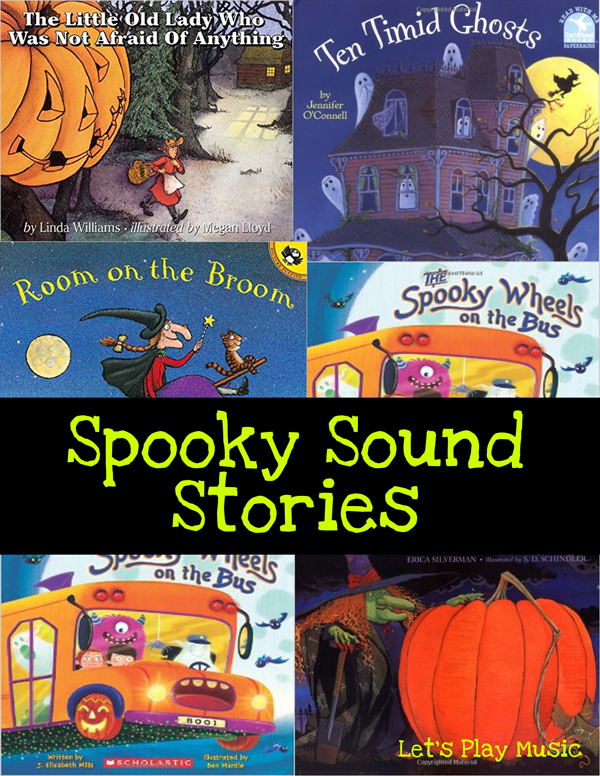 These Spooky Sound Stories for Halloween are a great way to encourage kids to get creative with making sound effects. The poem below is a great way to get started. The first two verses might be familiar as they are an old traditional children’s poem, but I had fun adding some more verses. This activity can be kept quite simple for younger children, by using just a few instruments and with the teacher reading the poem and directing the sound effects as they should occur. But older children love the chance to read it out themselves and to be in charge of all the choosing and directing of the sounds. Start the activity by reading the poem through together, and depending on how many children are in the group, and how you are dividing the class, you may need to print off several copies. Now decide together which words would be best to highlight with a sound effect (usually the descriptive, onomatopeas, and repetitive percussive ones) Use different coloured highlighting pens to highlight these words throughout the poem, so they can be easily spotted. Now choose the sound effects together, obviously percussion instruments make good taps and knocks, but you might need to collect some alternative sounds. For example, a large bunch of keys for the jangling chains, a hooting whistle for the owl, a stick scraped on a wire basket for the rattling skeleton; the possibilities are endless and depend very much on what you have available, but the most important thing is to be imaginative and resourceful and that’s the fun part! Once decided, make a key to indicate which sound to use and where it should go, by writing the sound effect below the poem in the same colour as the highlighted word it belongs to. The kids enjoy doing this bit and it helps them understand the process. Allow some time for each group to perform their poem in front of the rest of the class. An engaging, creative halloween activity that gets everyone involved! 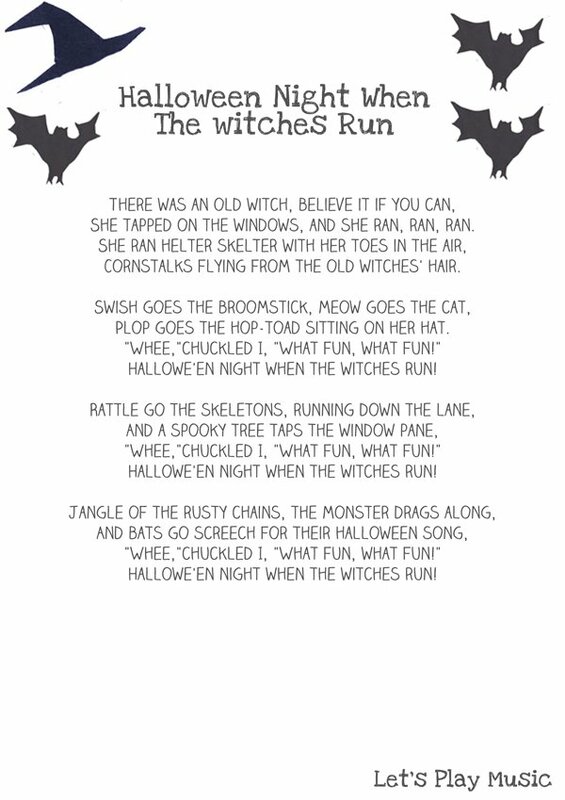 Download and print the Halloween Night When The Witches Run spooky poem here. Here are some more spooky favourites, which would also be perfect to use as sound stories. A perfect choice for adding sound effects. The little old lady goes for a walk in the woods at night, and despite all the clomps – clomps, shake – shakes and clap- claps she ends up having a great big surprise! This engaging halloween tale about a witch who picks up lots of animal companions for a ride on her broomstick is a hugely favourate. 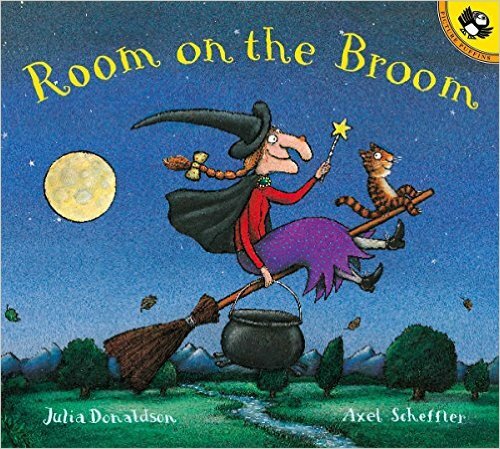 Choose a different percussion instrument to represent each animal as they all squeeze on the broomstick together. But the real fun starts when they encounter a dragon, and all her animal companions join forces to scare off the dragon with their scary cacophony of a strange ” yowl and a growl, and a croak and a shriek! “ Plenty of scope here for some improvisation! 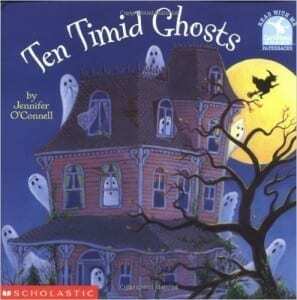 This one is an excellent choice because it sneaks in useful counting backwards practice too. 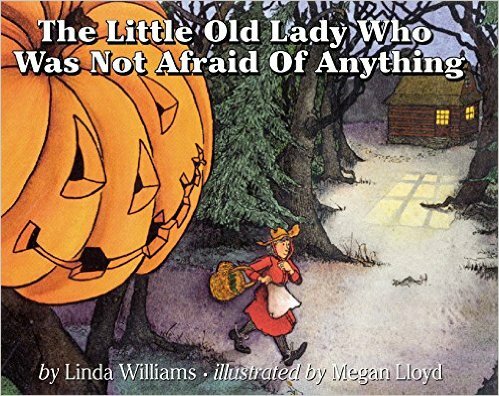 This crafty witch uses lots of ingenious disguises to scare off the ten timid ghosts. 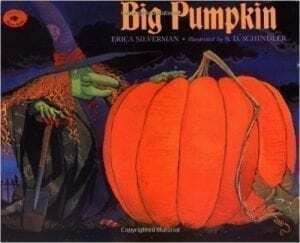 Use a different sound effect each time to illustrate the different halloween characters. The Big Pumpkin earns it’s place on the list simply because it’s simple, repetitive, rhythmic flow just begs to read out loud. In a similar vane to traditional The Great Big Enormous Turnip, the witch has terrible trouble trying to pick her huge pumpkin. Despite various attempts by her halloween friends (each depicted by a different instrument) the clever little bat comes up with a pal to save the day, bringing that very useful message that ‘brains are better than brawn’! 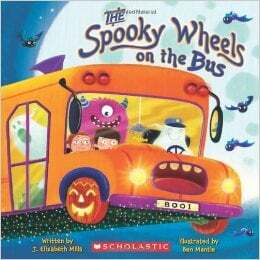 A great book that combines singing and counting as the traditional song introduces each different halloween character on the bus with plenty of scope for all the different sound that they make. Disney is the master for using sound tracks to add atmosphere! There are lots of different short’Silly Symphonies’ cartoons in the archives on youtube, which are a wonderful example of using percussion to add colour. It’s well worth watching some to get a little inspiration, and you could get the kids to join in with their percussion too as they watch the cartoon. People often ask what equipment I use for playing musical excerpts in music lessons. Of course if you have the original CDs you can play them with a conventional music player using a remote control for stopping and starting. But these days the easiest way is to play them straight from youtube by using your phone or ipad and some handy bluetooth speakers. Here are two really good choices; I’d recommend the Anker Soundcore for use in an average sized room, but these JBL Flip 4 speakers pack a bit more of punch if you’re in a bigger space. 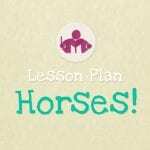 Check out our Halloween Lesson Plan for lots more spooky educational ideas in a 30 min lesson. Music teacher or homeschooler? 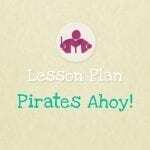 You might find my new music lesson plan series useful! We have the book Click, Clack, Boo that I’ll be reading to my class. Sound effects of Creak, Crunch and Tap. Thanks for reviewing these books! I love children’s literature!